I've just returned from a nearly three week vacation in Asia, and the culmination of that trip was two days spent at Disney's newest theme park, Shanghai Disneyland. There will most assuredly be plenty more photos from this grand and truly beautifully designed park in the months to come, but I thought I'd start with a Christmas scene from the park. Yes, Shanghai Disney does have some Christmas decorations--primarily clustered around its entry area, Mickey Avenue, and central hub land, the Gardens of Imagination. It seems that not even a Chinese government that is sensitive to American-centric content objects to the import of an American visualization of the holidays, and at the Gardens of Imagination, this results in a towering Christmas tree becoming part of the park skyline during this season. With numerous bodies of water all around this core area, abundant photo ops exist to capture lovely reflections and enhance the yuletide illumination. This is just a hint of the beauty that's been designed into a park that has been marketed as "authentically Disney and distinctly Chinese." 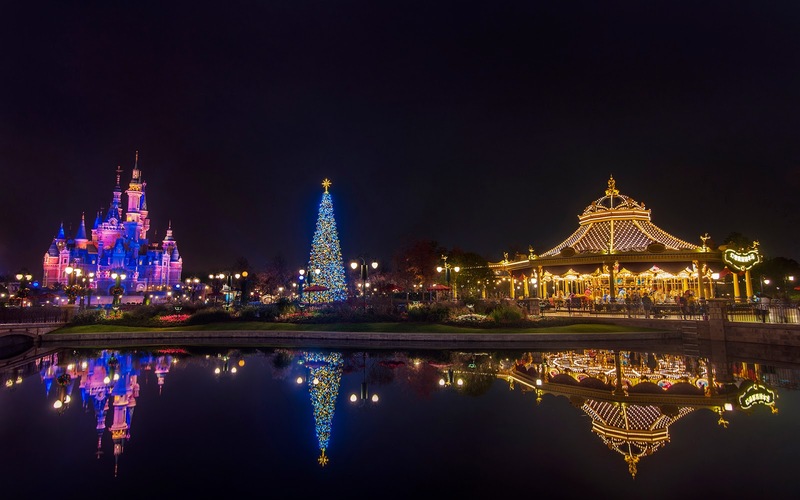 During Christmas time at Shanghai Disneyland, three icons mark the nighttime skyline at the Gardens of Imagination.